Few consumers are aware of the economic forces behind the production of meat, fish, eggs, and dairy. Yet omnivore and herbivore alike, the forces of meatonomics affect us in many ways. This is the first book to add up the huge “externalized” costs that the animal food system imposes on taxpayers, animals and the environment, and it finds these costs total about $414 billion yearly. With yearly retail sales of around $250 billion, that means that for every $1 of product they sell, meat and dairy producers impose almost $2 in hidden costs on the rest of us. A $4 Big Mac really costs society about $11, and regardless whether you even eat meat, you incur a share of $7 in external costs each time someone buys a burger. Perhaps more troubling, consumers have lost the ability to decide for ourselves what – and how much – to eat. Those decisions are made instead by animal food producers who control our buying choices with artificially-low prices, misleading messaging, and heavy control over legislation and regulation. Learn how and why they do it and how you can respond. 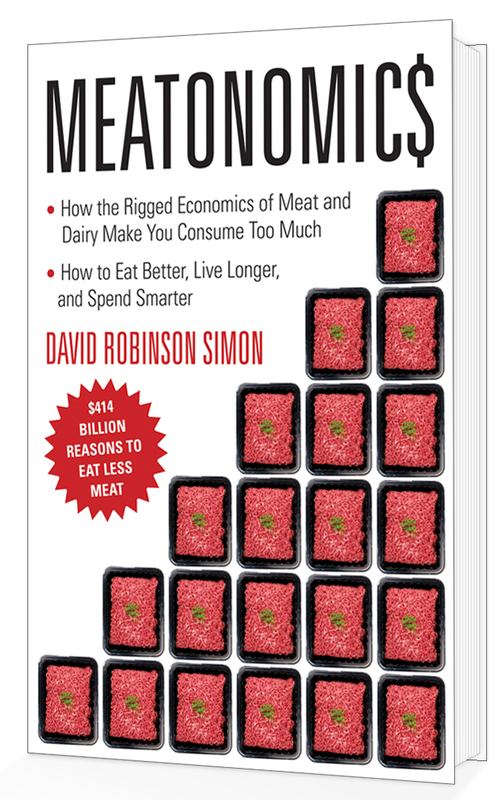 Written in a clear and accessible style, Meatonomics provides vital insight into how the economics of animal food production influence our spending, eating, health, prosperity, and longevity. Thanks Celeste – I look forward to reading yours too! People need to be more informed…My doctor told me about fish from China that we should not be eating. That is just one thing. Great article and I am so glad I read it. Everything in this universe is interconnected, the littlest of our actions (karmas) has an impact on our environment and the eco system around us. Abusing animals and inflicting pain on them simply for our eating pleasure is reprehensible especially when there are healthier and more sustainable alternatives lika plant based diets, a pratical example is the millions of Hindus and Buddhist who are vegetarians mainly on the Asian sub-continent. You are a hero for the animals Dave! I look forward to reading your book soon. KUDO’s on this critical piece of work. Thanks Mary, great to hear from you and I hope you enjoy reading it! Why are veggie burgers more expensive than beef patties? I would like to read your book, and a few others of similar topic. However, like your theories of not paying for meat, dairy etc. to get your point across. I don’t necessarily want to spent $20+ and shipping on a book that I don’t agree with, but would like to see the facts in. If you would be interested in sending me a copy, I would like to hear what you have to say about the industry. For many years, Gentle World volunteers have been searching for the perfect piece of land on which to expand our educational program in Hawaii. During this time, we have been limited by our less than two acres of space, with the number of visitors seeking to participate in our program increasing year by year. Now, thanks to a generous loan from an anonymous vegan donor, Gentle World has just purchased 34 acres of magnificent countryside, in the foothills of The Kohala Mountain on the Big Island of Hawaii. Here is where we will realize our dream of VeganLand… a sanctuary for the vegan in everyone. Because it is surrounded by several other available parcels, ranging in size from 9 to 88 acres, we are hoping to expand our vegan homeland, until the whole road is owned by vegans. Wouldn’t that be something? If anyone is interested in being a part of this creation, either by buying one of the adjoining parcels, volunteering skills and talents, or by contributing financial help toward the cost of building VeganLand’s infra-structure, please contact us.